Here is Corado, a 17-yr-old warmblood being worked on the longe line in a circle. From a side view such as this one, especially in person, we can see a lot about how he’s traveling: whether he’s calm or tense, quick or slow, even or unlevel in his movement, and his general demeanor. While we cannot see if he is sound in his movement by just observing a photograph, we can see that he is alert (head up, ears forward), traveling at a somewhat easy-going trot (the leg position tells us it’s a trot while the relaxed tail and foot-falls close to the ground reveal a lack of excited animation), and generally at ease (soft eye). But even in person, it can be difficult for the untrained eye to see the way he’s balancing himself laterally (from side to side). Now we are viewing Corado from the front as he continues around the circle at the trot. From this vantage point, we can see how he carries his body straight as he leans into the turn. 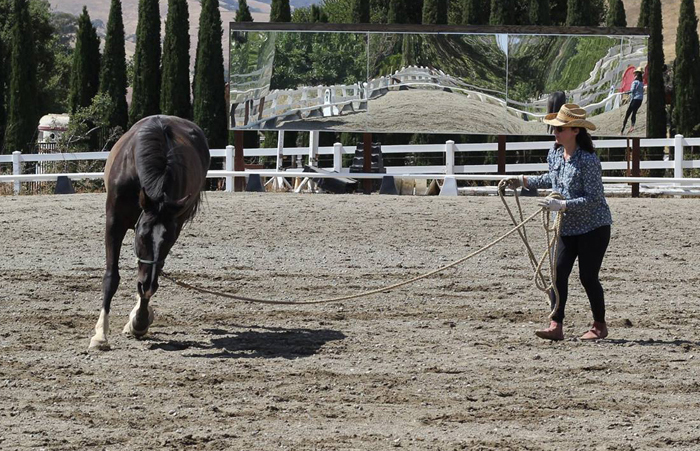 Leaning is the most expedient way for a horse to make its way through a turn, just like a bicycle or motorcycle would. But as you can see, he is placing more of his weight on his inside fore- and hind legs. Because the travel distance is shorter for the inside legs and longer for the outside legs, his inside legs must take smaller, quicker steps to compensate, creating a tendency to scramble. Having a straight body that leans into the turn also causes a brace that contributes to him moving like a stiff board. 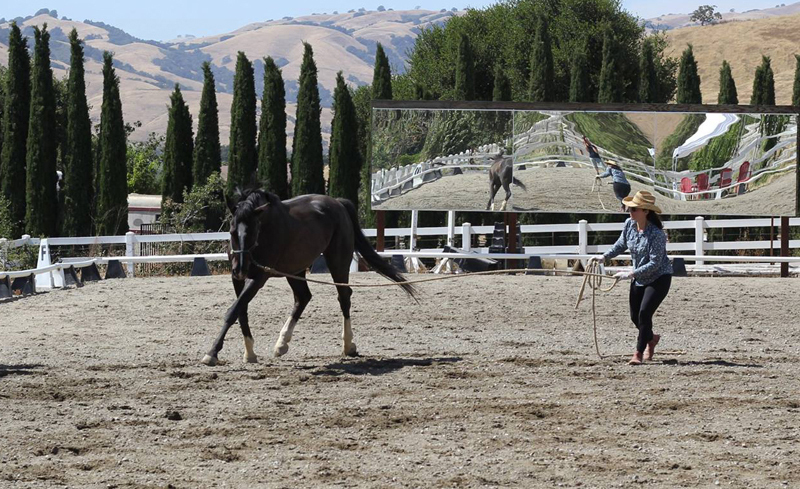 There are reasons why we might want our horses to lean into a turn. 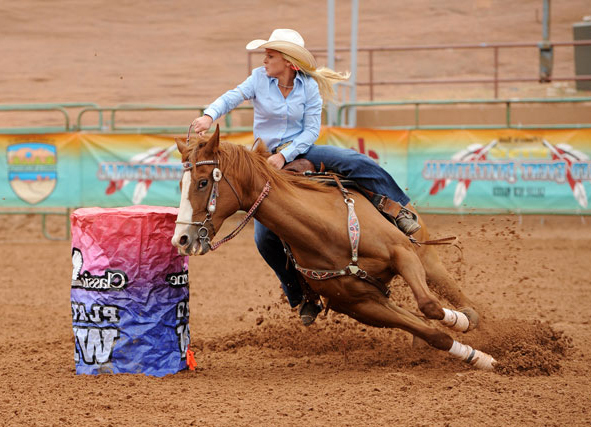 As mentioned, it is the most expedient way to maneuver that turn — or around an object if you are a barrel racer, for example. 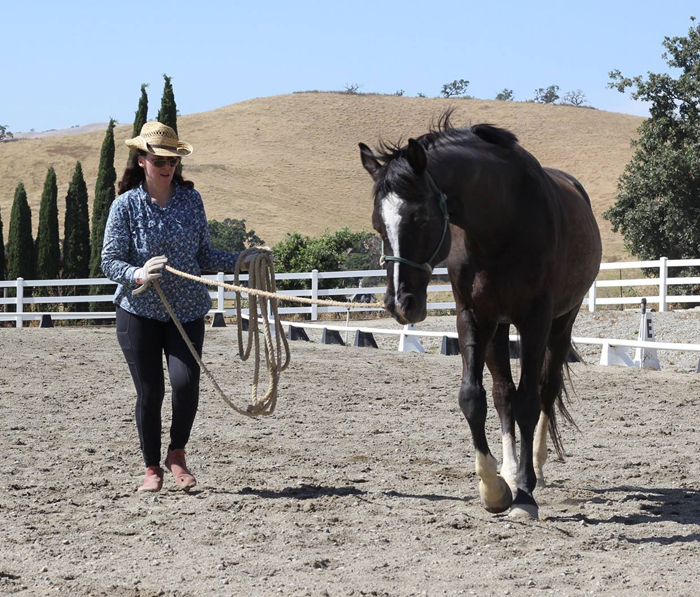 But if instead of rushing, your intention is to move in a way that promotes a greater degree of malleability, softness and suppleness, then you will want to first distribute the horse’s weight more equally onto all four legs. 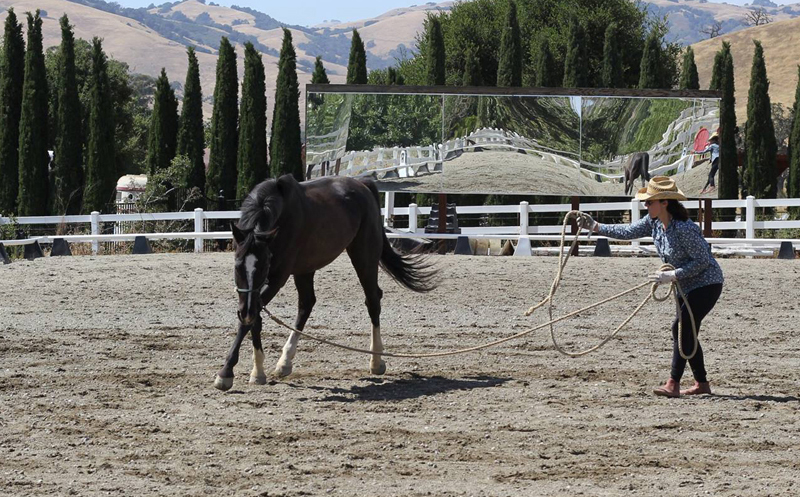 To do just that, Corado’s owner has slowed him down to a walk in order to work on his bend. She is drawing the head in towards her with one hand on the line, while at the same time extending her other hand toward his shoulder to apply pressure, if you will, influencing him to shift his weight off of his inside shoulder and onto the outside fore- and hind legs. Now you can see how Corado is vertically upright and his weight more evenly balanced on all fours as he begins to bend in line with the arc of the circle. The same applies to the opposite direction. 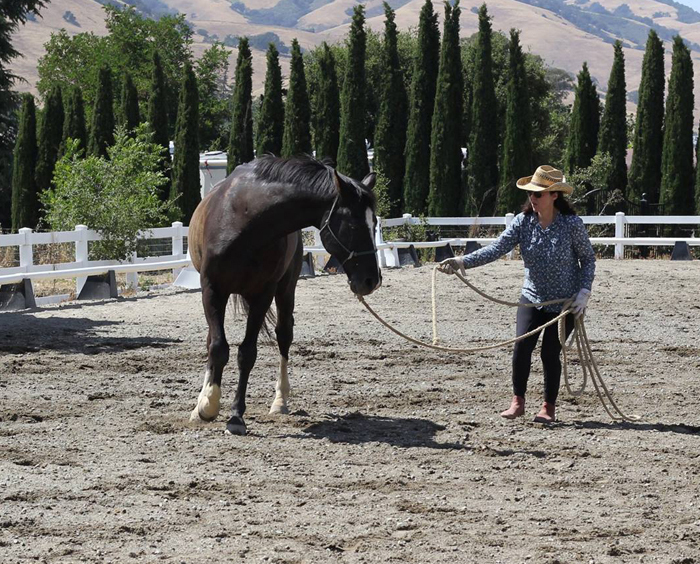 It takes time, coordination (in the person) and patience to communicate what is meant when pressure is applied at the shoulder as his owner demonstrates here, drawing the head in to initiate the bend while using her opposite hand to encourage Corado to yield his weight away from her toward the outside (for more explanation, see: http://www.naturalsporthorse.com/pyramid2.html under “Lateral Relaxation”). The bend also helps him release any bracing throughout his body that traveling “as straight as a board” can create. Note the slack in the line, indicating that he is, at least for the moment, soft and malleable in the hand. In the left-hand photo below, Corado begins again at the trot by leaning into the turn. He is not being unwilling or defiant, it is simply his nature to take the more energy-efficient path, but he will eventually learn to do what he can now do at the walk at all three gaits. 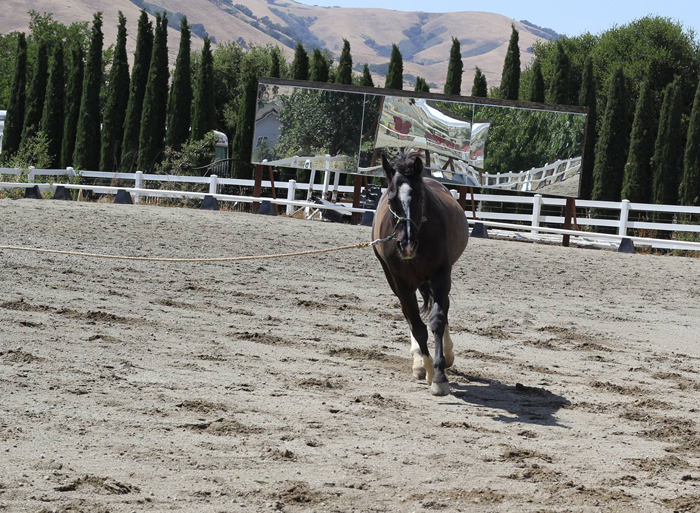 His owner is farther away in order to give him room to go forward, but in order to renew the bend at the trot her actions are applied the same way as they were at the walk, drawing his head in towards her to initiate the curve in his body while driving the shoulders out as demonstrated in the photo on the right. Note how Corado’s inside foreleg crosses over the outside foreleg as he begins to bend his body (his hind leg will do the same in the next stride). This diagonal motion is equalizing the length of stride on each side by allowing the inside legs to travel the longer distance that the outside legs travel on the circle. This crossing action both evens the stride and acts as a suppling action for the legs, shoulders and hip joints. 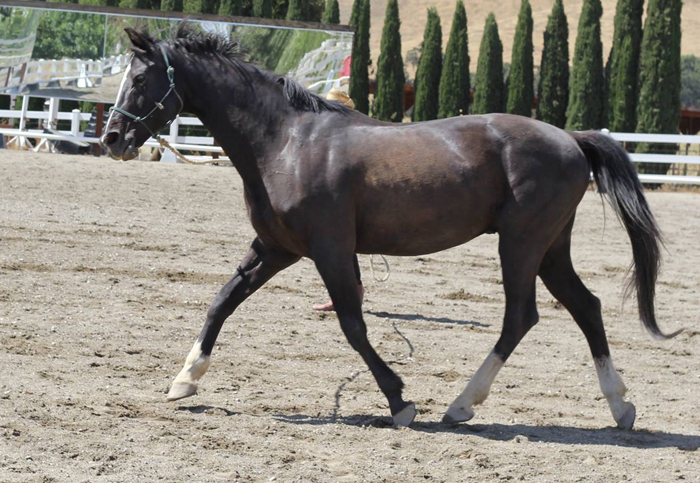 In this final photo, Corado has achieved both a lateral bend in his body and a longitudinal stretch toward the ground at the trot, suppling the muscle groups both along the sides of his rib cage and over his back. Note his relaxed demeanor and how much play there is in the line, letting us know he is now soft and pliant. Thanks, Terry, for taking the time to “put pen to paper”. Clearly written with illustrative photos which (I think) someone could follow and understand, even without access to you in person. Such a gift! Yay! So pleased to hear it, Mary Ann! Hope you are well. Sending best wishes!